Investigative journalist, and Logan’s ex-girlfriend, Melita Garner is invited to the Jean Grey School of Higher Learning by Beast, to compile a “Complete History Wolverine,” despite Logan issuing a ‘cease and desist’ order. Each section with a different interviewee is done by a separate artistic team, which ranges from fun, colorful cartoony, to more stylized, gritty tones to match their stories of remembrance. There’s even a double page spread of a collection of Wolverine snapshots over his various incarnations, showing a refreshingly wide range of representations. Students, professors, and X-Men each have a different perspective on Wolverine, some more interesting like Wolverine trying his hand at karaoke and even trying to cook pterodactylus for Thanksgiving, while setting everything on fire in the process. Melita’s visit is not without incident and a danger room exam is triggered in the cafeteria during an interview. This shows Logan’s lasting effect on the school, especially his desire to equip the students with the skills to deal with the real world. These serious moments are interpolated with enough light heartedness to make this book more of a celebration of a much loved character than an oppressively sad eulogy to an amazing, but admittedly flawed, man. Love or hate the Death of Wolverine mini, this felt like a pretty perfect goodbye, ending with Nightcrawler bringing Melita to Wolverine’s favorite hangout, raising a glass in his honor with all the regulars. 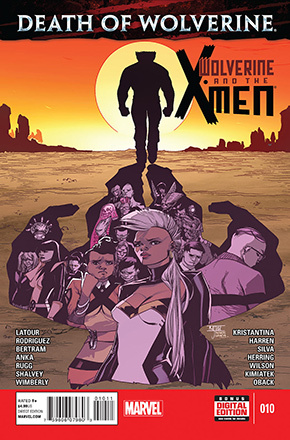 Jason Latour employs the help of several artists to give Logan his final farewell and his own personal farewell from writing this series between this and issue #11. The series itself is surviving in its own way, even beyond the death of its title character. Before Wolverine died, he made it clear he wanted Spider-Man at the school for a reason unbeknownst to the rest of the X-Men. Spidey will step into the role of guidance counselor in the new Spider-Man and the X-Men series by “The Daily Show” writer Elliott Kalan and artist Marco Failla, debuting in December. Spidey may be a friend of the X-Men, but he’s no mutant. He’s more of an outsider than part of the family, and there can only be tensions considering his true identity isn’t quite known for sure.